NEW ORLEANS – Very few major surprises came to light in last week’s declarations for the NCAA Division I Outdoor Track & Field Preliminary Rounds, and consequently very little changed in the national team race. 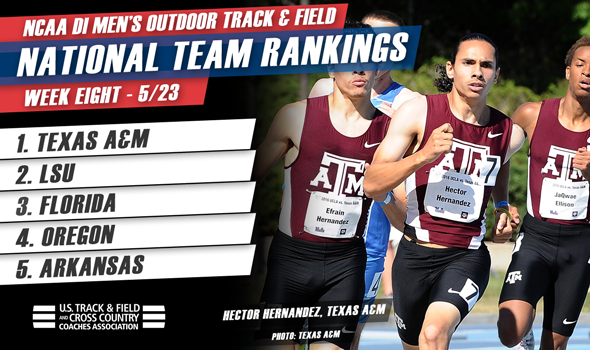 Texas A&M continued to hold steady atop the Pre-NCAA Preliminaries edition of the National Team Computer Rankings announced Monday by the U.S. Track & Field and Cross Country Coaches Association (USTFCCCA), but the chase pack is starting to creep up. Each of the next five teams in line behind the Aggies (348.27 ranking points) remained in place – that would be No. 2 LSU (261.50), No. 3 Florida (241.09), No. 4 Oregon (239.46), No. 5 Arkansas (225.08) and No. 6 Georgia (167.88) – and each of them gained at least about 10 points on the 2016 standard-bearer. These rankings only take into account the entries into the East and West Preliminary sites, to be held in Jacksonville, Florida and Lawrence, Kansas, respectively, on May 26-28. Ranking points do not equate to NCAA Championship points, but do reflect the relative projected strength of each team at the NCAA Championships on June 8-11 in Eugene, Oregon. Among the top-12 teams in the nation, only No. 7 Texas and No. 8 Alabama swapped spots from a week ago. The race for the men’s national team title may culminate next month in Eugene, but teams must first successfully navigate the road through either Jacksonville or Lawrence with as many Championships qualifiers as possible. As a refresher, the top-12 finishers in each event from both the East and West region – 24 athletes/relay teams total — will make it to Hayward Field. Decathlon and heptathlon qualifiers have already been announced. While Texas A&M may currently lead the race for the team title, it won’t be the Aggies with the biggest Prelims contingent looking for safe passage to Oregon. That would be the No. 5 Arkansas Razorbacks, who will bring a whopping 41 entries to the West competition. That’s six more than the Aggies will field in Lawrence, and significantly more than No. 2 LSU’s 24 entrants to top the East Prelims. No. 3 Florida has 21 entries in the East and No. 4 Oregon has 28 in the West. But qualifying big numbers to either Lawrence or Jacksonville is only part of the battle. They still have to make it to TrackTown USA. Arkansas still looks to have the edge in that department, as well. The well-rounded SEC Champion Razorbacks have 23 entries seeded top 16 in the West Region –12 qualifiers and four on the bubble of qualifying, based on seeds – while Oregon has 20 and Texas A&M has 17. Out East, the trio of LSU, Florida and Alabama all have 14 entrants seeded 16th or better. The final piece of the battle is actually scoring points at the NCAA Championships in mid-June. That’s where the Aggies’ biggest advantage finally comes into play. Texas A&M’s roster currently features 11 entries seeded in position to score points – by finishing top eight – compared to eight each for the No. 2 Bayou Bengals and No. 3 Gators, seven for the double-defending champ Ducks, and only four for the No. 5 Razorbacks. Of those 11 potential scorers for Texas A&M, three are their respective events’ favorites, two are seeded second, and three more are seeded third. As for whether those numbers hold up through this weekend’s NCAA Prelim competitions? The National Team Computer Rankings are complied by a mathematical formula based on national descending order lists. The purpose and methodology of the rankings is to create an index that showcases the teams that have the best potential of achieving the top spots in the national team race. Rankings points do not equate with NCAA Championships team points. A full description of the rankings can be found here.